This post has already been read 1149 times! 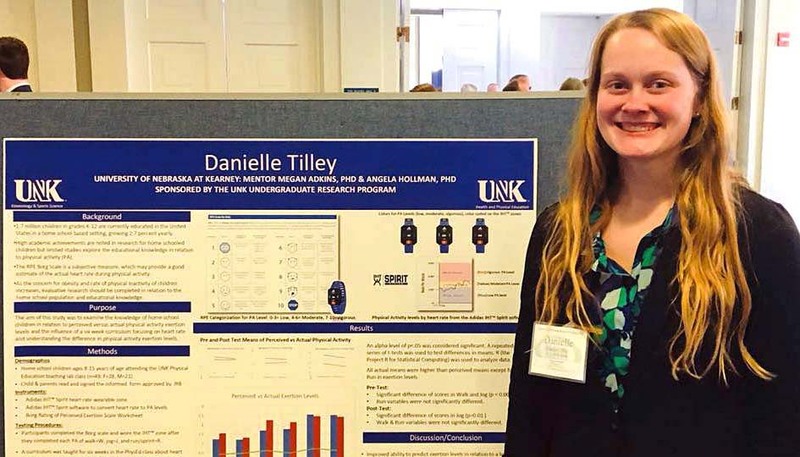 WASHINGTON – University of Nebraska at Kearney student Danielle Tilley was recently named one of 60 winners in the national “Posters on the Hill” contest sponsored by the Council on Undergraduate Research. Her research project demonstrated how physical education heart rate technology gave home-schooled students a more accurate picture of their fitness by showing the differences between their perceived and actual exertion levels. Tilley, a senior from Columbus, earned a trip to Washington, D.C., where her project was selected as a winner from more than 400 submissions. Of the winning entries, only three posters focused on education, and only Tilley studied physical education. She’s the first health and physical education major from UNK to be selected for the event, which gives students the opportunity to showcase their research to congressional members, meet with their representatives and learn about advocacy for undergraduate research. Tilley presented her research project during an April 18 ceremony in the Rayburn House Office Building. Her research demonstrated the difference Kearney-area home-school students saw in their actual effort levels compared to their perceived effort levels during a weekly physical education class held at UNK. “There is a lot of information about the home-school population when it comes to academics, but a very minimal amount of information when it comes to fitness awareness and fitness levels,” said UNK associate professor and health and physical education program chair Megan Adkins, who served as Tilley’s adviser on the research project. a walk, jog, sprint test for students to determine their exercise intensity. wrist monitors to determine students’ heart rates during exercise. software to analyze students’ heart rates and show actual exercise intensity during the workout. research-based lessons designed to introduce students to health-enhancing activities. Tilley said the students’ initial perceptions were predictable, especially during the walk and sprint portions of the fitness testing. During the jogging portion, students perceived that their exercise intensity was greater than the heart rate data showed. After six weeks, students left with a better understanding of their actual exertion levels, as well as the realization that fitness requires more than attending a weekly PE class. Tilley, who is on track to graduate next year after she completes her student-teaching requirement, wants to make her mark as a PE teacher. While in Washington, Tilley and Adkins met with U.S. Rep. Adrian Smith, who joined them to speak in detail about the project and home-schoolers in Kearney. Read more about Tilley’s project and Interactive Health Technologies here.